Tenacious is a fast-paced rogue-lite dungeon crawler by Firebelley, with a heavy emphasis on loot. Tear your way through levels and swap gear on the fly to change your abilities. Loot rare items to enhance your abilities. Spend your gold at the forge to create your own play style. Each item grants you a uniquely powerful ability when equipped. Equipping rare versions of an item will enhance the ability in a powerful way. Equip up to 4 unique items, each with their own enhancements, and tear your way through the dungeon fighting bosses and packs of monsters. 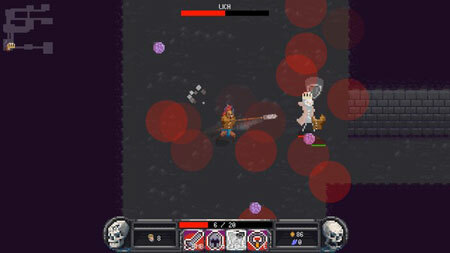 The game features 21 unique usable items, 42 unique legendary affixes, 2 bosses, and 6 enemy types. If you get stuck in the game, check out the video walkthrough and gameplay for the game. This entry was posted in PC Games, Walkthrough and tagged Tenacious Cheats, Tenacious Gameplay, Tenacious Guide, Tenacious Strategy, Tenacious Walkthrough by Marvin. Bookmark the permalink.